Proving once again that we do live in a special place, the New River Valley community of builders is leading the way in energy efficient new construction. EarthCraft Virginia recently unveiled their list of the Top 10 Most Energy Efficient Homes of 2013 and two New River Valley builders were heavily represented. 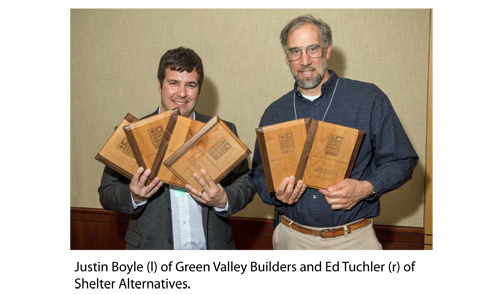 Green Valley Builders and Shelter Alternatives, both of Blacksburg, together were recognized for contributing six homes to this sustainable building list that represents the entire Commonwealth. Both local builders have previously had homes recognized by the organization for sustainable excellence. The remaining 40% of the homes were built in the greater Richmond and Charlottesvile areas. Earthcraft Virginia also recognizes improvements to existing homes. Shelter Alternatives was awarded their 2011 EarthCraft Virginia Single Family Project of the Year award for an extensive remodel of a home in downtown Blacksburg, the first and only certified EarthCraft Renovation project in the region. All of the homes acknowledged undergo extensive review and third party testing by EarthCraft and are designed with application of building science and best building practices that support a high degree of sustainability. The homes are ultimately evaluated with an energy score or HERS rating after testing. A HERS rating for a standard home built to code in Virginia is 100, so with a 27 to 49 rating range for these top ten homes , all of them can expect less than half the typical energy usage and cost of a new home in the area. See the list of recognized homes. Ed Tuchler and his team at Shelter built my dream home for me in 2004, and it has more than fulfilled every expectation I had based on what I knew of this company’s reputation. Joe Bassett was our designer: he was extremely knowledgeable about building techniques and could not have been more pleasant to work with. The team has also been great about follow-up on minor problems and with advice and service on some maintenance needs. I do recommend them with the maximum enthusiasm every chance I get.